Nardwuar The Human Serviette News: Nardwuar / Evaporators Events In Vancouver, Seattle, Olympia & Portand ! 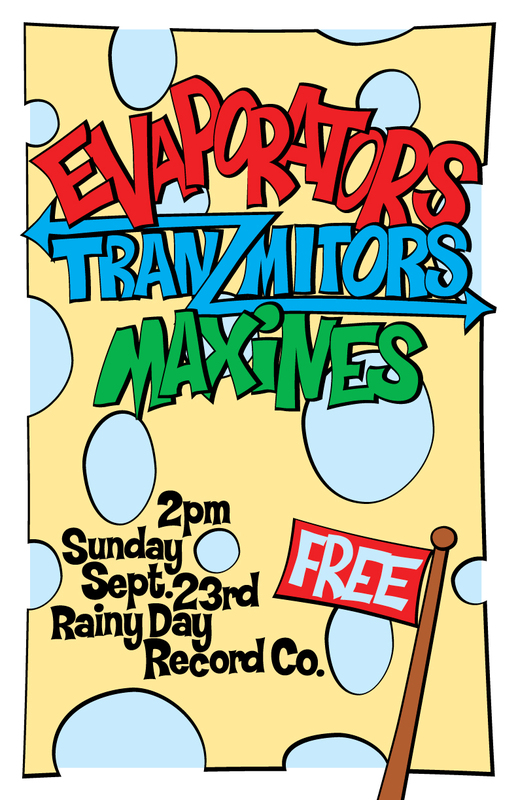 Nardwuar / Evaporators Events In Vancouver, Seattle, Olympia & Portand ! 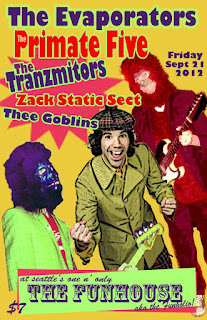 Some Upcoming Nardwuar / Evaporators Events In Vancouver, Seattle, Olympia & Portand ! 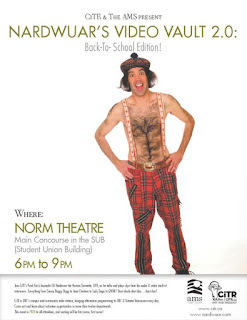 1) On Saturday Sept 8th, from 2:30-4:00pm at Chapel Arts (304 Dunlevy Ave) in Vancouver, BC Nardwuar will be sharing some of his interview experience in a FREE workshop called "Interview Tips From Nardwuar." It's all part of an amazing event that Safe Amp in Vancouver has put on featuring among others Ian Mackaye and Calvin Johnson. 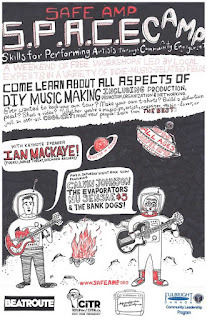 Nardwuar's band The Evaporators are also playing an ALL AGES gig later that nite at Chapel Arts (Evaporators on at 9pm) with Nu Sensae and the Bank Dogs. Doot doola doot doo ... doot doo! Facebook Event Page is HERE! 2) On Monday Sept 10th, from 6:00pm-8:00pm at The Norm Theatre in the SUB Building at the University of BC in Vancouver BC, CiTR Radio is Presenting "NARDWUAR'S VIDEO VAULT 2.0: Back-To- School Edition!" Yes, join CiTR's Punk Rock Journalist, DJ Nardwuar the Human Serviette, LIVE, as he talks and plays clips from his audio andvideo vault of interviews. Everything from Snoop Doggy Dogg to Jean Chretien to Lady Gaga to GWAR! Doot doola doot doo ... doot doo! FREE and ALL AGES ! Facebook Event Page is HERE! 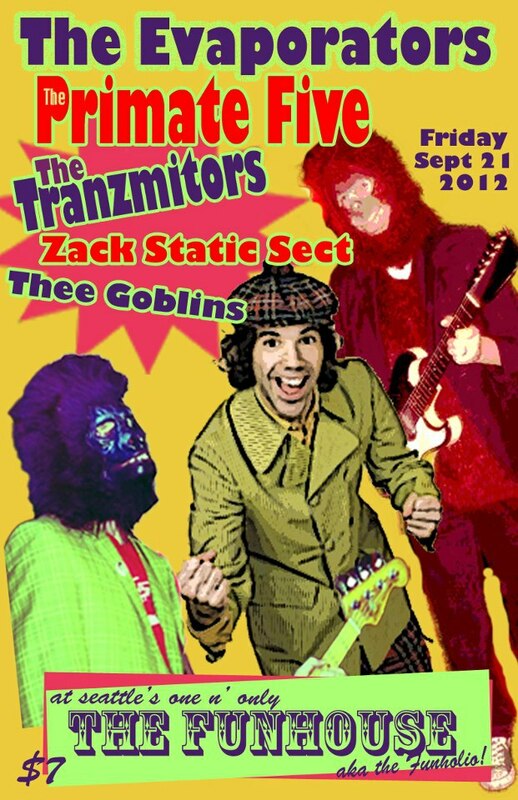 3) On Friday Sept 21, The Evaporators will be playing The Funhouse in Seattle, WA (206 5th Ave North) with The Primate 5, Zach Static Set and The Tranzmitors. 21+ Facebook Event Page is HERE! 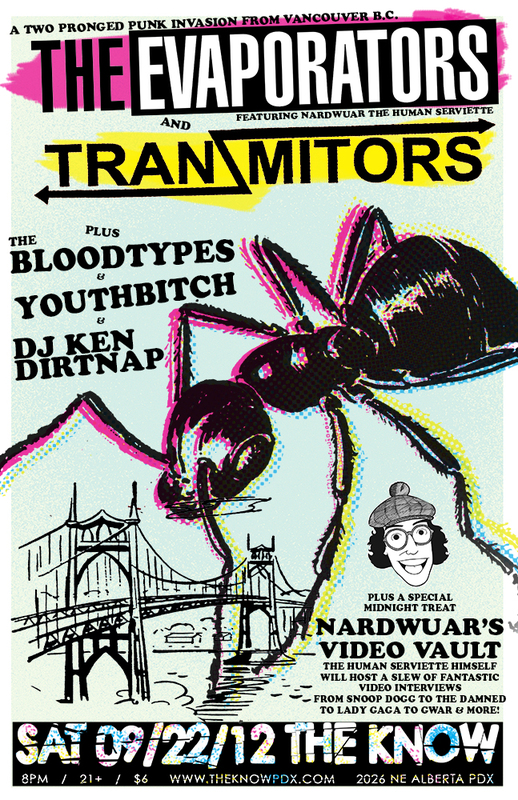 4) On Saturday Sept 22, The Evaporators will be playing The Know in Portland, OR (2026 Northeast Alberta Street) with The Bloodtypes, Youthbitch and The Tranzmitors. 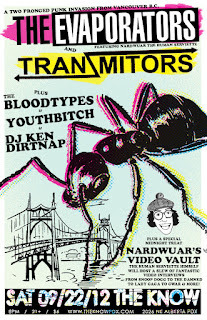 21 + Plus Nardwuar will also be showing some of his "Video Vault" on The Know's big screen after the show ends @ Midnight. Facebook Event Page is HERE! 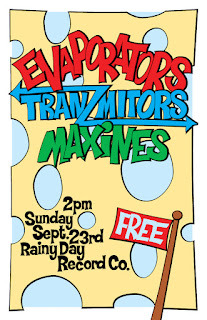 5) On Sunday Sept 23, The Evaporators will be doing a FREE afternoon instore at Rainy Day Records in Olympia, WA (301 5th Ave Southeast) with The Maxines and The Tranzmitors. Show starts at 2pm! ALL AGES! Facebook Event Page is HERE!